TREASURE RAIDERS blazes onto DVD! As of Tuesday, June 2, he’s only as far away as wherever DVDs are rented and sold … and his name isn’t Vin Diesel or Paul Walker. International action star (and author and producer and writer and bodybuilder) Alexander Nevsky’s latest movie, Treasure Raiders, has already been a big theatrical hit in his native Russia (where it was filmed). His previous movie, Moscow Heat, was shot so beautifully that the city of Moscow was practically its own character; Hong Kong legend Tony Leung choreographed the action performed by an international cast including Nevsky, Michael York (The Three Musketeers, Austin Powers), Adrian Paul (Highlander), Richard Tyson (Kindergarten Cop, There’s Something About Mary), Joanna Pacula (Tombstone), Andrew Divoff (Indiana Jones and the Kingdom of the Crystal Skull), and Robert Madrid (who co-wrote the script with Nevsky). Every action scene in Moscow Heat was entirely different, from the massive SWAT assault on a gang of evil international arms dealers to the final sword-fight that brought the movie full circle both visually and thematically. Moscow Heat had a heart, and it conducted itself with rare measures of thoughtfulness and character that are missing from far too many of today’s action offerings. 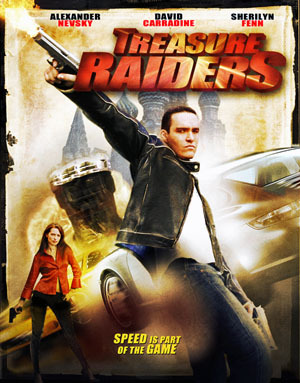 Treasure Raiders offers more of the same — it combines the spirit of The Da Vinci Code and National Treasure with the speed of The Fast and the Furious, with dazzling action and inventive automotive mayhem on the mean streets of Moscow. We begin with a flashback hinting at the mysterious history of a treasure hidden somewhere in Moscow, immediately giving the movie a unique dose of Indiana Jones-sized urgency. Flash forward several centuries to modern-day Moscow, where visiting American professor Michael Nazarro (The Scorpion King‘s Steven Brand) finds himself in an unexpected after-class meeting with an enigmatic gentleman named Pierre (played by David Carradine of Kill Bill and Kung Fu), who might know more about missing treasures than Michael himself. And is it more than just a coincidence when Michael walks right into a seemingly accidental collision with a gorgeous Russian firecracker called Masha (Olga Rodionova)? Moscow is full of secrets … but Michael has secrets of his own. How does this globetrotting treasure hunter fund his expensive expeditions? With four wheels, a full tank of gas, and skill, skill, skill. Michael’s needs for thrills and speed bring him up against Wolf (Nevsky), the king of Moscow’s underground racing scene who just happens to be a six-seven mountain of muscle. After their first race doesn’t turn out the way Michael expects, he begins to suspect that Wolf, too, isn’t everything he appears to be. How does Moscow’s past intersect with Wolf’s, and how can Wolf help Michael save the key to an even greater mystery? Buy the movie and find out. Brand balances the wisdom and warmth you’d expect from a professor with just the right amount of boyish glee that makes him believable behind the wheel. Gorgeous Twin Peaks star Sherilyn Fenn once played Liz Taylor on screen and provides that same kind of old-school Hollywood glamour as Wolf’s love interest, Lena. William Shockley (Dr. Quinn Medicine Woman) is visually memorable and utterly nasty as a wicked drug dealer who wants his own slice of the pie, while Moscow Heat‘s Madrid and Divoff appear in smaller roles that make use of their big talents. While Nevsky’s character in Moscow Heat had to quickly adapt to the international incident about to explode right under his nose, Wolf allows the charming star to come across as even more of a natural, capably shouldering action and intrigue with more confidence than ever before. His charisma is reminiscent of a young Arnold Schwarzenegger, and his combination of size and soul makes him a rising action star to watch out for. 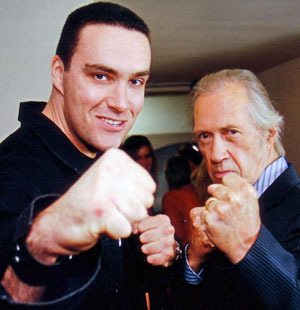 And of course there’s David Carradine, whose tragic death this week came as a terrible shock to movie fans around the world. Carradine does some of his best work since Kill Bill in Treasure Raiders. As sad as the situation is, at least his work will live on forever in amazing performances like this. Fists fly and bullets sizzle, but the biggest draw here is a collection of car stunts that puts big Hollywood budgets to shame. Characters and archaeology get plenty of attention and time, too, resulting in some breathtakingly beautiful tours through some of Moscow’s most ancient and inspiring architecture. My writing partner Kevin and I are writing the screenplay for Hercules: The Beginning with Alexander, and we are excited and honored beyond words to be working with someone who values action and story equally. So please give Treasure Raiders a spin … and be sure to buckle up first. Check out Alexander’s Treasure Raiders webcast right here! Awesome review John. Makes me want to watch it again.